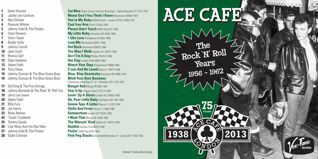 Vee-Tone Records celebrate 75 years with Ace Cafe London. This anniversary album embodies the style and culture of Ace Cafe London and showcases the spirit that has endured through the ups and downs of this iconic British institution. Featuring 28 British & American Rock ‘n’ Roll recordings released in the UK between 1956 and 1962 ( on Single, EP and LP ). The tracks are rebellious, wild and frantic much like the cultural shift in Britain that the Ace helped drive throughout the ’50s and ’60s. This is the soundtrack of the Ton Up era and subsequent Rocker culture!